An entire Roman landscape has been discovered by Museum of London Archaeology, a few feet below the surface at Grade I listed Syon Park, West London. 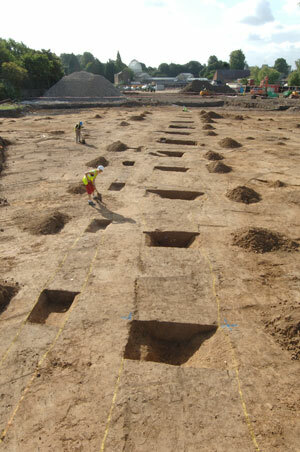 The revelations come following excavations undertaken in August 2008 by the museum in advance of the construction for the new luxury hotel London Syon Park, A Waldorf Astoria Hotel, set to open in early 2011. The Roman remains include a Roman road, settlement and Roman burials and have laid remarkably undisturbed only half a metre below the ground surface for almost two thousand years and are of local and national significance. With some of the artefacts due to be displayed in the new hotel, the discovery sheds light on the workings of Roman Britain and on Roman activity in and around Syon Park, from the 1st century AD onwards. Jo Lyon, Senior Archaeologist at Museum of London Archaeology said, “We were extremely fortunate to discover such a comprehensive repertoire of Roman finds and features so close to the surface. They tell us a great deal about how the people of this village lived, worked and died. The site revealed a section of one of Roman Britain’s most important roads, linking Londinium with the Roman town of Silchester, a rural settlement, an ancient tributary of the Thames, Roman human skeletons and some very unusual burials. Thousands of Roman artefacts were recovered from the site, including two shale armlets, fragments of a lava quernstone as well as an exceptional Late Bronze Age (1000–700 BC) gold bracelet from an earlier age. Human skeletons found, could have been the remains of former occupants of the settlement, although the placing of the skeletons in ditches is particularly curious and more research is currently being undertaken by Museum of London Archaeology to discover more about these people and Roman West London. The dig revealed that the British landscape changed considerably under Roman influence with towns being established, interconnected by roads. These roads were markers of the ‘Romanisation’ of Britain. Londinium was founded c AD 48 on an uninhabited site. Its strategic position on the river Thames meant that it rapidly became the most important and largest commercial town in the province. Once a Roman road was built it started to attract settlement along it, like that in West London. The Syon Park and surrounding area was an attractive place to settle as it lay between the road and the Thames. The land was easy to cultivate and the presence of the road would have offered an additional source of income to the community from travellers seeking refreshment and lodging. London Syon Park, A Waldorf Astoria Hotel, is a new landmark luxury hotel for the Capital, due to open in early 2011. The stylish hotel is situated within 200 acres of beautiful parkland within the Grade I listed Syon House estate, seven miles from central London (just 20 minutes from Knightsbridge), and seven miles from Heathrow’s Terminal 5, London Syon Park brings contemporary luxury to its historical surroundings.